On July 1, stroll down the Passageway with mirrored silhouettes of 101 familiar Canadian symbols into the nexus of the Hall. Inside a giant rotunda called the Hub, visitors will find themselves on a massive map of the country, all 10 million square kilometres of it — a perfect launching pad to learn new things about the land we know as Canada. The Passageway into the Canadian History Hall. Photo: Canadian Museum of History. The Anishnaabe entrance to the Rossy Family Gallery. Photo: Canadian Museum of History. The first gallery winds into a treasury of weapons, tools, and personal possessions that display the industry and creativity of Indigenous peoples across the continent. Alongside archaeological evidence of First Nations activity as far back as the Ice Age, there is a fossilized piece of a mammoth jaw and teeth, an intricate diorama of Head-Smashed-In Buffalo Jump in Alberta, and a game to see how every piece of the bison was used to make something useful. View from the Rossy Family Gallery. Photo: Canadian Museum of History. You can meet the ancestors of the Inuit, the Thule, who proudly wore jewellery of copper and bear teeth, as well as stone facial piercings and hairstyles that may have been used to convey status. An impressive display of facial reconstruction technology introduces the bead family of Shíshálh, four family members of high standing who lived approximately 4,000 years ago. The differences in habits and heritage of many different Indigenous peoples is elaborated with great detail. One display compares the Indigenous names alongside the simplified traditional European names attributed to them, like the Haudenosaunee, or Five Nations Confederacy (now Six Nations), which Europeans simply called the Iroquois. Astrolabe thought to belong to Samuel de Champlain. Photo: Canadian Museum of History. The roles of Frenchman Samuel de Champlain played in the history of Canada were many. He was known as an observant chronicler, a diplomat and a soldier, and ultimately a settler whose statue on Nepean Point depicts him holding his famous astrolabe that went missing. A corner exhibition dedicated to the man known as the “Father of New France” houses an astrolabe that may or may not have belonged to him, but it was discovered along a route he is known to have travelled. View from the Fredrik Eaton Family Gallery. Photo: Canadian Museum of History. The second Gallery, named for the Fredrik Eaton Family, covers Colonial Canada until the eve of the First World War. Several aspects of life in Canada changed with the introduction of guns, horses, and disease, while a century-long conflict between English and French Canada raged over dominance of the fertile land. The integration of French and then British rule forever changed the lives of Indigenous peoples. The Métis of the Northern Plain were one of the first people of mixed heritage to choose a flag: a blue banner with a white infinity loop. Some see the symbol as two peoples meeting to become one, while others identify with its message of hope that the Métis nation will never fade. There are also mentions of the growing reputation of Montreal as a world-class city, the complications with living next to the United States, and the trending fashion of hooded overcoats, known as “capots” or “canadiennes”, during the French regime. The third gallery is the size of the other two combined, named after donors Hilary M. Weston and W. Galen Weston, and it covers the period that is currently being written: Modern Canada. From 1914 until 2017, the mezzanine overlooking the Hub has no chronology, just a diverse layout reflecting the complicated nature of Canada. The push for independence and prosperity, the interwoven story of First Nations told in their own words, and the identity of Canada on the world stage all play major roles in the top-floor gallery. The floor is filled with memorabilia like Terry Fox’s Marathon of Hope t-shirt, Maurice “Rocket” Richard’s Montréal Canadiens jersey, and Lester B. Pearson’s 1957 Nobel Peace Prize. How Quebec nationalism has shaped not only the province but the rest of the country is examined from province’s Quiet Revolution to patriotic separatism that almost bubbled over during two referenda in 1980 and 1995. A T-shirt worn by Terry Fox during his 1980 Marathon of Hope. Photo: Canadian Museum of History. There are painful panels to read that shine a light on the cultural suppression of Inuit and First Nations culture for many decades. One large pull quote from our founding Prime Minister John A. McDonald stands out: “Indian children should be withdrawn as much as possible from the parental influence.” Right around the corner are the colourful and vibrant art pieces in painting and dress that only the Haida of British Columbia could design. The #IdleNoMore movement also takes a prominent display amongst the sometimes uncomfortable history of the past federal stance on Indigenous peoples and their fight for respected rights. Visitors will find conflicting images of a country far older than its 150 years of Confederation. The main message of the extensive and sometimes controversial Hall is that Canada is a great mix of conflict, struggle, and loss while also of success, accomplishment, and hope. The “Gateway to the Rockies” exhibit at the Whyte Museum of the Canadian Rockies provides insights into the origins of tourism that visitors can use to enrich their present day mountain experiences. The history of the Canadian Rockies reads like an epic adventure rich with hidden treasure, daring acts of bravery, forward thinking mavericks and passionate conservationists. It’s a bit of a cliché that most citizens of this country are defined by a hyphenated identity—you’re Italian-Canadian, or Polish-Canadian, or even, in the case of Keriwa Café chef-owner Aaron Joseph Bear Robe, Aboriginal-Canadian. The Alberta native, son of a Blackfoot father and Scotch-Nova Scotian mother, fittingly combines the influences of his heritage at his Parkdale restaurant, in seasonal and locally sourced dishes that do modern justice to time-tested culinary traditions. While First Nations staples like bison pemmican with red fife fry bread ($14) are on offer, don’t head into this woodsy-chic dining room expecting an exclusively (and anachronistically) “Native” experience. Order up possible mains like rainbow trout with dill gnocchi ($23) or duck with rutabaga and quince ($25), too, and enjoy an encompassing taste of Canadian-ness. Tucked away on Vancouver Island, north of Nanaimo off the Island Highway is Coombs, a place that’s become known for its signature rooftop of grazing goats. Under that roof is The Old Country Market, a quirky grocery store that offers a huge selection of breads and sweets made in their bakery, a cheese shop and imported foods that run the gamut from English licorice to bacon-flavoured mayonnaise a.k.a. Baconnaise. Right about the time the great Klondike gold rush was fading into myth and legend, the once hopeful miners sitting back with their feet up in front of fireplaces down south and telling lies to their kids about the glory days searching for color, someone thought to ask Chief Isaac what he’d thought about it all. Isaac was the leader of the Tr’ondëk Hwëch’in, the First Nations people who had lived and hunted and fished around the confluence of the Klondike and Yukon Rivers for thousands of years. He was a man who had followed the land’s seasons until he knew every valley, every rill, like his mother’s face. And there’s the part of the gold rush legends that usually gets left out: what did the locals do when the stampede started? What happened to the people who had no interest in gold? Back in 1898, Chief Isaac looked at the mud, the violence, the drunkenness of Dawson, and got his people out of there, relocating them upriver to the village of Moosehide—where there’s still a regular celebration of the Chief’s life and legacy. But that wasn’t far enough. As game grew more and more scarce in the rush years, many of Isaac’s own people had no choice but to join the cash economy. And so the riverboats that plied the Yukon came to be crewed mostly by First Nations men, men who had spent their lives on the river in canoes. And in the forests, men who had once fed entire villages with their hunting skills, became woodcutters for a few cents a day, feeding ship engines that could burn through a cord an hour. Of course, not all Native groups had it so bad. Further south, the Tlingit and Chilkoot actually had it pretty good. Although the main gold-rush trail—from Skagway or Dyea to Bennett Lake—passed right through their territory, it was through a chunk that they didn’t use much. In fact, local legend says the word “Skagway” originates in a Native term for “only white people are stupid enough to live where the wind blows that hard.” A more correct reading of the Tlingit “Skagua” or “Shgagwei” would be “a windy place with white caps on the water.” But just because the Natives didn’t use the land much didn’t mean they couldn’t control it. They controlled freight hauling on the passes, charging unheard-of sums: $1 per pound, at a time when two bucks was a really good day’s wage. Most Chilkoot porters could easily carry 100 pounds (45 kilograms) on a trail that went straight up a snowy mountain; one man became a legend for getting a 350-pound (159-kilogram) barrel up to the peak. And, unlike the Tr’ondëk, who were essentially evicted from their homes, pushed out by the stampeders, here the territory in question was really only useful as a path to somewhere else. The miners left with hardly a trace, except that the Natives now had a lot more guns, which made hunting the still-plentiful game a whole lot easier. Right when the streams and rivers of the Yukon had all been claimed and the flood of gold was starting to dry up, a far richer strike came to light: gold on the beaches of Nome. Everybody who hadn’t made their fortune in the Klondike packed up and headed west, to the continent’s edge, for the North’s last great gold rush. But those beaches were never an important spot for the Natives. Nome sits on a rolling plain, in tundra the color of musk-ox underfur. Beautiful, but not useful for hunters. About 15 miles (24 kilometres) south of town, though, is a wetland in the middle of a stopover, the migratory flyway for hundreds of thousands of birds. Traces of Native settlement there date back centuries. Why move? Why pay any attention to all these newcomers standing in freezing-cold water and sifting dirt? Of course, since the rush petered out, Nome has changed. The town is now predominantly Native, a hub for dozens of villages scattered around the Bush. Nome still has people working the beaches, though, searching for that glint of gold, even as Native hunters return, caribou strapped to the ATV they bought in the local grocery store, just an aisle or two over from packaged meat they don’t really count as food. More than a hundred years since the world’s attention first turned to the riches of the North, miners and locals continue working out the best ways to live in the same landscape. For more than 84 years, the Harlem Globetrotters have dazzled fans of sports and showmanship around the world, even presidents and popes. This weekend, they’re dusting off their best moves for three shows at the Rogers Centre: tonight at 7:30 p.m., and tomorrow (April 9) at 2 and 7 p.m. Kicking off another spring is the Total Health Convention and Exhibition, taking place this weekend at the Metro Toronto Convention Centre and featuring more than 200 exhibitors. Attendees can also hear from 60-plus speakers on topics like “The Ancient Healing Art of Ayurvedic” or “Health Effects of Genetically Modified Foods.” Don’t miss the gourmet organic café or the spa oasis! Learn about and celebrate the traditions of First Nations peoples at Survival of the Indigenous Spirit. The fundraiser will take place at the University of Toronto’s Innis Town Hall offers talks by Anishnabe spiritual leader Dave Courchene and Survivorman Les Stroud. Proceeds support the Vision Quest & Makoose Ka Win project. Bring the kids to a classical concert they may actually enjoy, as the Sony Centre and Warner Bros. presents Bugs Bunny at the Symphony. Two showings (at 2 and 7 p.m.) feature the Kitchener-Waterloo Symphony performing live while Bugs Bunny at the Symphony and other classic cartoons are projected on the big screen. Starting today, Veggielicious takes place at more than 20 restaurants and bakeries across Toronto. Specials on vegan dishes or prix fixe menus are on offer at establishments such as Bunner’s Bake Shop—where you can get a Veggielicious Snack Pack for $7.50—and Live Organic Food Bar, where for $25 you can experience a three-course 100 per cent vegan meal. 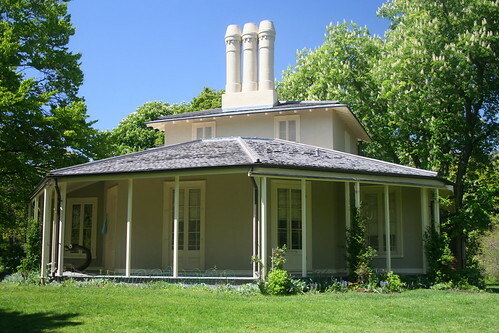 Get a head start on all the family fun at Easter Traditions at Colborne Lodge, taking place from noon to 4 p.m. Kids and families can tour High Park’s historic Colborne Lodge while they learn and participate in 19th-century Easter traditions like dyeing and hunting for eggs. For old and young alike, stamp collectors will enjoy spending the day at the National Postage Stamp Show at Exhibition Place’s Queen Elizabeth Building. Check out the North Toronto Stamp Club’s annual show, meet with dealers from across Canada, the United Kingdom, and the U.S., and participate in prize draws. Three exciting Asian-inspired exhibitions beckon visitors to the Textile Museum of Canada: Beauty Born of Use: Natural Rainwear from China and Japan showcases the historical use of natural elements like straw, bark, vines, and seaweed to create waterproof and eco-friendly clothing; artist Kai Chan’s A Spider’s Logic brings together common household items reminiscent of his Chinese upbringing to create nature-inspired elements; and, new to the museum, Silk Oasis on the Silk Road: Bukhara displays a collection of ikats and silks from Central Asia’s textile- and history-rich Silk Road.